What is it? A free mapping tool. Simply paste data from a spreadsheet and see it plotted on a map. How is it of use to journalists? Journalists who cannot code and have no technical knowledge have a wide range of tools available to them for plotting data and creating maps. Here is a regularly updated spreadsheet on Nato attacks in Libya. 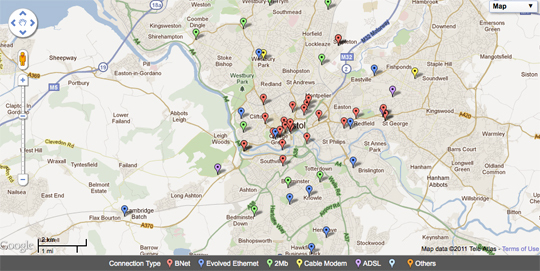 Here is a list of Bristol City Council wifi hotspots. This entry was posted in Handy tools and technology, Tool of the Week and tagged Andy Hume, Batchgeo, Bristol, Mapping, tool of the week on September 13, 2011 by Sarah Marshall. More bad news for the freebie sector: paidContent:UK reports that up to 30 redundancies are planned for Metro’s regional arts and entertainment sections. Parent company DMGT declined to comment. This entry was posted in Editors' pick, Job losses, Jobs, Newspapers and tagged Birmingham, Bristol, DMGT, food pages, Glasgow, Manchester, Metro, Newcastle, paidContent, United Kingdom on August 27, 2009 by Judith Townend. Tony Elliott, the proprietor of listings magazine Time Out, is considering selling control of the title to help fund online expansion. “We want to develop in Edinburgh, Bristol, Leeds and Manchester; in Miami, Los Angeles and San Francisco. And we’d certainly not look to launch magazines in places like Paris or Los Angeles without a developed website in place first,” he told the Times. This entry was posted in Editors' pick, Magazines and tagged Bristol, Edinburgh, Leeds, listings magazine, Los Angeles, Manchester, Miami, online expansion, Paris, proprietor, San Francisco, The Times, Time Out, Tony Elliott on May 27, 2009 by Laura Oliver. Poll: Is Paul Dacre right to criticise Justice Eady’s use of the privacy law? Daily Mail editor Paul Dacre has caused some controversy this morning after last night’s opening speech at the Society of Editors annual conference – leading to discussion on the Today programme – and widespread media coverage. This entry was posted in Events, Newspapers and tagged Bristol, Daily Mail, High Court, judge, justice eady, Mail editor, mass-circulation newspapers, Newspapers, Paul Dacre, privacy law, Society of Editors, the Society of Editors annual, Twitter on November 10, 2008 by Judith Townend. A quick heads-up that the NCTJ online survey is still open, which first launched in September. The idea is to get feedback to help re-shape journalism training and qualifications provision. It takes about ten minutes to do, and will close on Wednesday October 8. The big question behind it all: how can training can meet the needs of employers in the multimedia world? The report will be published in November and discussed at the Society of Editors’ 2008 conference in Bristol 9-11 November, and the NCTJ conference for heads of journalism in Salford 4/5 December. This entry was posted in Training and tagged Bristol, nctj, ONLINE survey, Salford, Society of Editors, www.qualasys.com/nctj_survey_2008_industry.htm, www.qualasys.com/nctj_survey_2008_providers.htm on October 3, 2008 by Judith Townend. Northcliffe Media has launched its East Midlands regional business site, which sees five of its titles working together to supply content. The Evening Telegraph in Derby, Leicester Mercury, Lincolnshire Echo, Nottingham Evening Post and The Sentinel in Stoke will provide regional business news to thisisbusiness-eastmidlands.co.uk, which will also cover international business stories. Journalism.co.uk first broke the news of the planned Northcliffe business sites in February, and the launch of the East Midlands site follows that of westbusiness.co.uk, a business site for the West Country area, covering Gloucestershire, Bristol and Bath. The new site aims to promote the business capabilities and achievements of the East Midlands area. “Allying thisisbusiness to the pages of the daily titles in the region will create a new springboard for everyone who has the ambition of the East Midlands at heart.” said Alex Leys, Northcliffe Midlands managing director. A third business site is expected to be launched in the South East later this year. This entry was posted in Newspapers and tagged Alex Leys, Bath, Bristol, Business, business site, Derby, Echo, Gloucestershire, Journalism.co.uk, Leicester Mercury, Lincolnshire Echo, managing director, Northcliffe Media, Northcliffe Midlands, Nottingham Evening Post, The Evening Telegraph, The Sentinel, WestBusiness.co.uk on May 1, 2008 by ruth morgan.